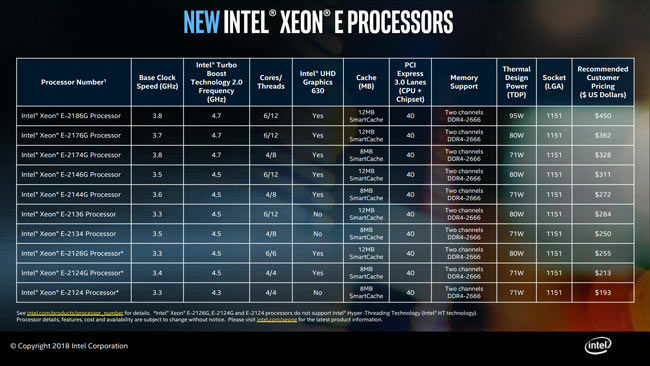 New Intel Xeon E CPUs to top off with 6 cores / 12 threads and offer 16 PCIe lanes each. Top SKU to be priced at $450. Intel has launched the Xeon E line of processors which are set to replace the older E3 v6 Kaby Lake based CPUs. These entry-level CPUs are based off the Coffee Lake architecture and are using the 14nm++ process node. 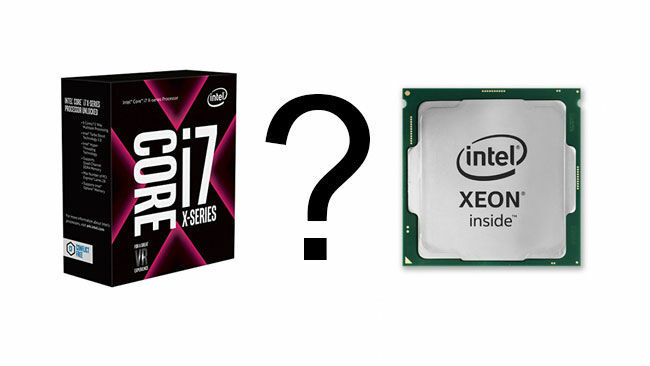 Intel did rename their entire Xeon Scalable lineup last year to do away with the complicated nomenclature but these new entry-level CPUs don’t fall within the same family. The Xeon E-2100 CPUs start off from quad-core non-hyperthreaded SKUs priced at $193 and go all the way up to hexacore hyperthreaded SKUs priced at $450. All CPUs launched today use the LGA1151 socket. Today’s launch includes 10 processors with varying core configurations but they all support dual-channel DDR4-2666 ECC and non-ECC UDIMM modules and offer 16 PCIe lanes. The chipset offers 24 lanes bringing the total count to 40 PCIe lanes. Here’s the SKU stack. The E prefix against all the CPU numbers indicates that they’re all entry-level SKUs and the ones with the G suffix indicate the presence of Intel UHD Graphics 630. The base frequency for the integrated graphics is 350 MHz and peaks at 1200 MHz. All CPUs sport the same IGP. There are three non-hyperthreaded CPUs and the rest are all Hyperthreaded. The SKU stack starts off from the 4-core/4-thread Intel Xeon E-2124 and is lead by the 6-core/12-thread Intel Xeon E-2186G at the top. The materials shared with us did not have the Turbo frequencies based on different core counts but just the single core peak values. As with their desktop Coffee Lake counterparts, these new Xeon E-2100 CPUs will require a new chipset, namely the C246, to run. There isn’t anything on Intel’s website about the new chipset but we’ve seen preliminary motherboards from iBASE, Supermicro, Advantech and others sporting the C246 over the last day. Needless to say, since these are entry-level SKUs, not a lot can be expected from a features perspective. Also, these are all single-socket solutions since Intel explicitly mentioned the same. 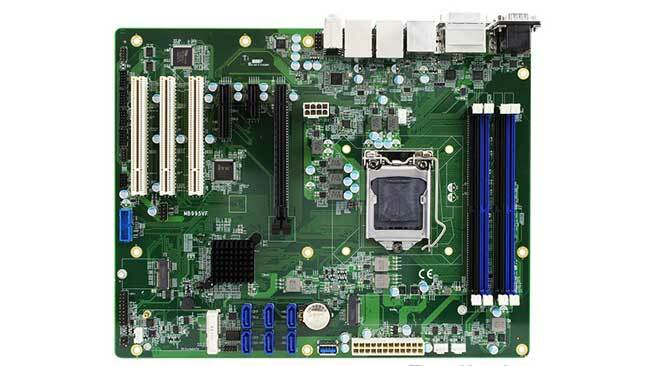 The specifications of the iBASE MB995 motherboard indicates that the C246 chipset will have a built-in Intel I210AT GbE controller and built-in High Definition Audio controller. As for CPU support, the C246 appears to support Xeon E, Core i7/i5/i3 Hex-Core/Quad-Core/Dual-Core CPUs up to 4.7 GHz. Why Xeon-E when Skylake-X exists? 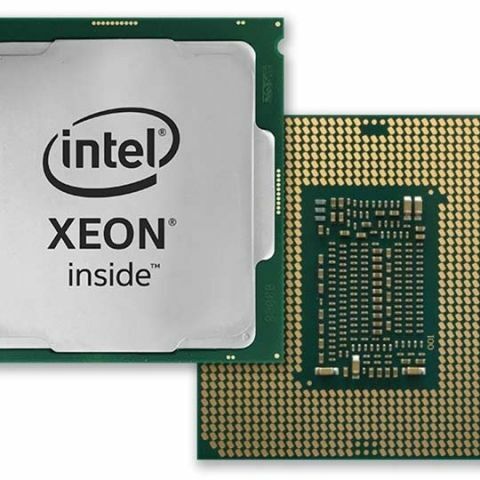 The Xeon-E CPUs being entry-level workstation CPUs match the use case of the Skylake-X HEDT CPUs such as the Core i7-7800X which was announced at COMPUTEX 2017. Compared to them, these new Xeon-E CPUs offer reduced TDP, slightly higher clock speeds and support for ECC UDIMMs. Unfortunately, the thermal interface is not solder which is a disappointment in the enterprise-class CPU lineup. Performance wise, there would be few applications that can run faster on the new CPUs. It’s the power savings and support for ECC memory on a smaller die-size that makes the Xeon-E appear appealing.